A structured typing program with a complete set of typing lessons for both the right and left hand. Five Finger Typist teaches the keyboarding technique for single-handed touch typing on the standard QWERTY keyboard. Users learn the home position and are then taken through a series of exercises which introduce new keys and revise keys already learned. Extremely easy, but flexible to use. You can follow the suggested learning sequence, or move ahead or back. The application remembers the last lesson worked in a user's document file and opens at that lesson next time. Lessons are graded, starting with simple exercises to assist with the learning of the correct key strokes, an animated hand graphic on the screen shows the correct hand movement as keys are typed. Five Finger Typist has some word processing capabilities, so users can learn limited word processing skills while typing. 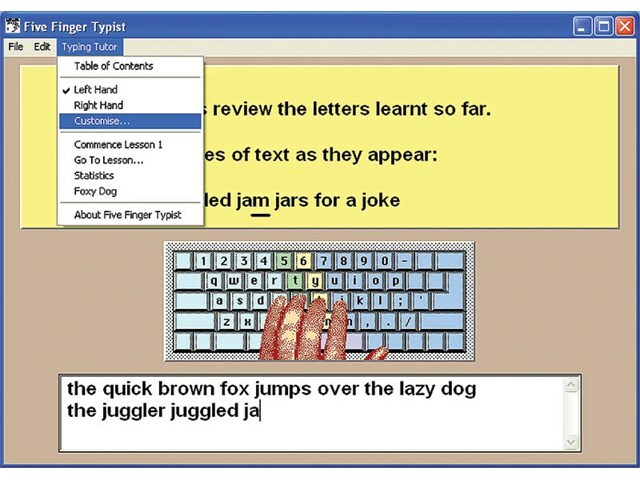 Typing lessons can be printed to show a pupil's progress. Read a comparative review of typing tutors by Melanie Jones.